Michael ROBERTO: Let’s play Shark Tank today. You’re the investors. Shark Tank, if you don’t know, is the TV show where people pitch business ideas to famous investors. ROBERTO: You might be Mark Cuban or Mr. Wonderful. You’re trying to decide, would you invest? And that is Michael Roberto. He’s a business professor at Bryant University, formerly of the Harvard Business School. There’s one lecture he likes to start by giving his students this fictional Shark Tank pitch. ROBERTO: And, of course, you get a lot of consternation. That’s when Roberto reveals that not only does such a grocery store already exist, but they’re crushing the competition. ROBERTO: They’re at the top by a wide, wide margin. The sales-per-square-footage estimates are unbelievable. I mean, three and four times better than some of the leading players in the industry. So it sounds like customers love this place. But you might think a store like this would be brutal to work for. And yet: it’s ranked among the 100 best American companies to work for. So what’s it called? Sheena IYENGAR: I do love Trader Joe’s. There is a good chance you’ve never shopped at a Trader Joe’s, maybe never even heard of it. It’s got fewer than 500 stores. The big chains like Kroger and Albertson’s have well over 2,000; Walmart sells groceries in more than 4,000 of its stores. And, as Michael Roberto told us, Trader Joe’s doesn’t advertise — or do a lot of things the typical grocery store does. ROBERTO: A typical grocery store has a SKU count — SKU stands for stock-keeping units, so it’s the number of different items carried in a store — well, typically a grocery store, or a supermarket, might have 35,000 SKUs, right? A tremendous selection and variety. And you go to Trader Joe’s they only have, say, 3,000 stock-keeping units in the typical Trader Joe’s. Kirk DesERMIA: The first thing I do when I know I’m going somewhere is get on the internet and find where the closest Trader Joe’s is. It’s never been easy to run a grocery chain. But Trader Joe’s makes it look easy — and, weirdly, fun. IYENGAR: I don’t walk into Trader Joe’s with a strong to-do list. It’s not a chore. When I walk into Trader Joe’s, it’s a variety-seeking exercise. So how do they do it? That’s the question we’ll try to answer today — a question made more difficult by the fact that Trader Joe’s is a fairly secretive company. ROBERTO: I think that some of the secrecy is probably due to who owns them. So we put on our Freakonomics goggles in an attempt to reverse-engineer the secrets of Trader Joe’s. Which, it turns out, are incredibly Freakonomical: things like choice architecture and decision theory. Things like nudging and an embrace of experimentation. In fact, if Freakonomics were a grocery store, it might be a Trader Joe’s, or at least try to be. It’s like a real-life case study of behavioral economics at work. So, here’s the big question: if Trader Joe’s is really so good, should their philosophy be applied elsewhere? Should Trader Joe’s — I can’t believe I’m going to say this, but … should Trader Joe’s be running America? I first got interested in Trader Joe’s about 10 years ago. I’d never been to one of their stores, but I had a general impression: cheap and cheerful; relatively laid-back and sort-of groovy, for a grocery store, apparently a reflection of its surfy California roots; also: not aggressively health-conscious, but leaning in that direction. And then I read a Wall Street Journal article about a German grocery chain called Aldi that was ramping up its U.S. expansion. Aldi is a super-cheap, super generic grocery store: 95 percent of its products were house brands, and it was beating even Walmart on price. The article said the Aldi chain had two branches back in Germany, separately owned by two wealthy brothers named Albrecht. And that one of those branches also owned Trader Joe’s. I found this fact surprising, only because when I think of German business practices, I don’t think of a groovy, earthy-crunchy, California surfy vibe. But there it was. I also learned that Trader Joe’s stores were much smaller than typical supermarkets, that they had their own way of doing things, and that places without Trader Joe’s often started petitions to bring one to their town. It was the sort of loony devotion usually reserved for sports teams or your favorite band. What kind of grocery store has a following like that? And then when I learned that Trader Joe’s outsells all other grocery stores per square foot, I really started paying attention. Then: one opened up near my office, here in New York. I started shopping there — and, for the most part, loving it. I realize it’s not for everyone; in fact, part of their strategy is trying not to be for everyone. But I did want to know the secrets to their success. We reached out to the Trader Joe’s headquarters, in Monrovia, Calif., and were politely told to get lost. As we mentioned earlier, the company is known for its secrecy. ROBERTO: The two brothers who founded Aldi North and Aldi South in Germany have a record of that. ROBERTO: That was kind of the family heritage, of really being pretty secretive about their business operations. You couldn’t even find photos of them on the Internet for years. They were very secretive. IYENGAR: So I’ve been studying choice — why do we want choice, what are the things that affect how and what we choose, and what are some things we can do to improve our choice-making abilities. Kirk DesERMIA: My name is Kirk DesErmia. I reside in Seward, Alaska. DesERMIA: The first thing I do when I know I’m going somewhere is get on the internet and find where the closest Trader Joe’s is. And we’ll hear from a spy in the house of Trader Joe’s, a former advertising executive named Mark Gardiner who became obsessed with the chain. What Gardiner learned about the company is that just about everything Trader Joe’s does, outside of exchanging food for money, is unorthodox for a modern grocery store. There’s a lot to talk about: the products, of course; the economics of their business model; their very home-made, do-it-yourself esthetic, including the hand-painted murals that reflect the neighborhood of every store. But let’s start with one of the first things I noticed when I started shopping there: the employees. Yes, they are friendly, and helpful, and enthusiastic. But what really caught my eye was the sheer number of employees. There are so many of them! If you go in during a slow time, you can easily be outnumbered by employees, in their TJ’s t-shirts and Hawaiian prints. One reason is that rather than stocking shelves overnight, like most grocery stores, Trader Joe’s stocks them during business hours. Why? As Mark Gardiner learned when he went to work there, the priority is to maximize customer interaction. So that explains why there are so many employees in the aisles. But there are also a ton of employees staffing the checkout. On one level, this makes sense: it makes the long checkout line move fast, and the checkout, after all, is where a store takes the customers’ money. Lesson number one in sales: don’t make it hard for people to give you their money! But Trader Joe’s also has employees directing traffic at the checkout line: one telling you which register to go to, one pulling you out of the big queue and into the final queue; and one or two holding up handmade signs marking the middle of the queue and the beginning. That’s three or four employees to do the job that most stores use zero employees to do, or maybe they use some software. But Trader Joe’s seems to be aggressively low-tech. No self-checkout aisles. No online ordering and pickup. No customer-loyalty programs — and, apparently, Trader Joe’s gathers no significant data on customers at all. In the modern business world, this is heresy. If you shop at Whole Foods, which is owned by Amazon, you can be sure the company has an algorithmic target on your back. Trader Joe’s, meanwhile? GARDINER: It really didn’t matter if it was a little old lady that was looking for one $5 bottle of wine, and if the wine shipment had just come in the back, I would go and look through 100 different cases and see if I could find the one that she wanted, and get her that one bottle of wine. If I spent 15 minutes doing that, and that made that customer really happy, then the managers were happy, and the store was happy. So this is a riddle. Here’s a company that doesn’t harness big data and doesn’t generally seem to embrace a lot of technology. It employs a lot of real, live people — and pays them above the industry standard: as of 2013, full-time Trader Joe’s “crew members” made about $50,000 a year while “captains” made more than $100,000, also with better-than-average benefits. But this is also a company that sells its products at very low prices. According to one of those investigations comparing a basket of items at a bunch of different grocery stores — this one was done in 2016 by the MarketWatch website in the San Francisco Bay Area — Trader Joe’s was easily the cheapest compared to Safeway, Target, and Whole Foods. It was 32 percent cheaper than Whole Foods. 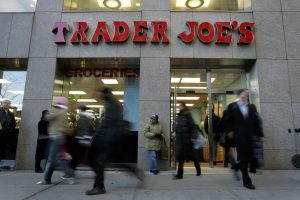 So how on earth can Trader Joe’s, as Michael Roberto told us, take in the most revenue per square foot in the industry? ROBERTO: They’re at the top by a wide, wide margin. A 2012 analysis estimated that Trader Joe’s sells just over $2,000 of groceries per square foot. Whole Foods? About $1,200. Walmart? $600. How is this happening? We should probably start with the products that Trader Joe’s sells. Here, let me read off some of what they says are their most popular items. Spatchcocked lemon-rosemary chicken and carne asada autentica. Kohlrabi salad blend and cold-pressed matcha green tea lemonade. Sea-salt-and-turbinado sugar-chocolate almonds and gochujang almonds; peanut butter-filled pretzels and five-seed almond bars. From the freezer section: chicken tikka masala and gluten-free cheese pizza with a cauliflower crust. These are the sort of foods that light up Instagram accounts and Facebook pages; that inspire fanatical devotion even among people who don’t have a Trader Joe’s within 2,300 miles — like Kirk DesErmia, who works as a facilities manager for the National Park Service in Alaska. DesERMIA: Whenever I leave the state, I usually buy a couple of hundred dollars worth of goods, and I have an extra suitcase or a duffel bag with me in my luggage. DesErmia and his duffel bag have been all over. DesERMIA: I’ve been, I know, to some in Portland, Oregon; Reno, Nevada. all over Southern California, there’s a number of them. My wife is from Kentucky, they have one in Louisville now, as well as Indianapolis. I go to D.C. about once a year for work, and love to go to the Trader Joe’s in Georgetown. What is it about Trader Joe’s foods that creates such a lust? Let’s put aside for a moment the question of how good their food is, especially since taste is subjective, at least to some degree. But there are a few things to say about how Trader Joe’s is at least different from a typical grocery store. First, there is a sense of globe-trotting adventure — the tikka masala, the carne asada, the gochujang almonds. That’s why Sheena Iyengar thinks of shopping there as a variety-seeking exercise. They also offer a rather unsubtle blend of healthy, or at least healthy-seeming, and hedonistic. Yes, you can buy kohlrabi salad and cauliflower-crust pizza. But you’ve also got your peanut-butter-filled pretzels and sea-salt-and-turbinado-sugar chocolate almonds. Speaking of which: turbinado sugar — also known as natural brown sugar. But still: sugar. Why add the “turbinado”? I have a few guesses. One: to say you’re just adding “sugar” to your already chocolate-covered almonds doesn’t sound very healthy. But “turbinado sugar”? Hmm … intriguing! Possibly even … sophisticated! Additionally: Trader Joe’s seems to understand what everyone in sales understands, especially real-estate agents: adjectives are inexpensive and often useful, especially when the actual virtues are limited. A “charming” house is often, in fact, a small house. Trader Joe’s reportedly puts a great deal of effort into scouting, sourcing, and producing food that their customers truly love; but they also pay a lot of attention to package design and descriptive salesmanship. Their marketing director is called “Director of Words & Phrases & Clauses.” They publish an old-fashioned newsprint bulletin, The Fearless Flyer, with in-depth descriptions of new products. When you walk into a Trader Joe’s, there’s a playful vibe, as if to say, “Hey, you’re just buying food; food is delicious, so enjoy yourself.” There’s also an artsy vibe, a writerly vibe — more so, oddly enough, than in a typical bookstore. These details, as casual as they might seem, would also appear to be strategic. In a 2011 interview with the L.A. Times, Joe Coulombe said when he started Trader Joe’s in the 1960’s, he was inspired by an article he read in Scientific American about the huge spike in Americans attending college. “I felt this newly educated … class of people would want something different,” he recalled, “and that was the genesis of Trader Joe’s.” Why’d he choose Pasadena as the first store location? “Because,” he said, “Pasadena is the epitome of a well-educated town. …Trader Joe’s is for overeducated and underpaid people, for all the classical musicians, museum curators” and, um, “journalists,” he said. This suggests that from the very beginning, Trader Joe’s understood cream-skimming — targeting a certain kind of customer and letting the rest slide by. As for the “underpaid” part of Coulombe’s equation? That would appear to be outdated: an analysis by the research firm AggData found that Trader Joe’s stores today are located in counties with higher household median income than any other grocery chain, including Whole Foods, and about $10,000 higher than the U.S. median income. But — and this seems to be another key component of Trader Joe’s success — they also value frugality. As Michael Roberto found, they usually set up shop in the cheaper parts of the expensive areas. ROBERTO: Frankly in many cases, they’re in sort of old strip malls, so they’ve saved money on the real estate. The real-estate firm Zillow found that homes near Trader Joe’s stores “appreciate more quickly than homes in the city as a whole,” concluding that either Trader Joe’s is really good at picking areas that are on the rise or that they are in part causing the rise. So how about a new store in Seward, Alaska? That is Kirk DesErmia’s dream. DesERMIA: I thought, “Man, these guys, maybe they just don’t know what they’re missing yet. And if I can create this Facebook page and I can get people around the state to start liking it and sending Trader Joe’s an email to say, “Hey, we would really love to see your store here,” then maybe Trader Joe’s will actually listen to us. DesERMIA: When I come home with a suitcase full, I like to throw it on the kitchen table and take a picture of it and put it out there, hopefully to motivate people to send that email to Trader Joe’s and let them know we’re out here. His Facebook page got some traction: about 1,200 likes. DesERMIA: I would say most of my friends in Seward are aware that this is something that I would like to see happen. DesERMIA: No. Some of my friends might say I’m fairly politically active, but I honestly I can’t think of any other store that I might think to start a page to bring up here. Seward, Alaska, does have a relatively high median household income. But the population is a problem: fewer than 3,000 people. DesErmia concedes that Anchorage, a few hours away, would be a more sensible site for the first Trader Joe’s in Alaska. And he’d happily make the drive. He just really wants a Trader Joe’s. DesERMIA: Every time I go to a Trader Joe’s in the lower 48, they always look sideways at me when I’m getting two to three hundred dollars’ worth of goods. But I tell them, “It’s because we live in Alaska and we can’t get you guys to come up here.” Since I started this page in 2012, and they’ve never responded to a single email, it seems a little unlikely. But hopefully, they’re going to listen to this interview and then my percentage will go up. ROBERTO: We’re all acclimated to every other supermarket looks the same. It has 35,000 items. It has 7 million varieties of toothpaste and tomato sauce. Every other player has all those things. ROBERTO: They only have, say, 3,000 stock-keeping units in the typical Trader Joe’s. Or 4,000 at most in one of their larger stores. Moreover, as we’ve learned, Trader Joe’s prices are relatively low. And yet: they also take in much higher revenues than stores that have more variety and more expensive items. So … how? Remember: Trader Joe’s doesn’t sell a lot of brand-name groceries. Roughly 80 percent of their products are private-label items, also known as store brands. ROBERTO: What that means is Trader Joe’s has mitigated the power that suppliers might have over them. So while they’re not nearly as big as Kroger’s they can get great purchasing power because they’re condensing all they’re buying in tomato sauce to one vendor for a very limited number of items. And when you’re selling something that you also manufacture, or at least source directly, you obviously stand to make more money than if you’re buying from a middleman. That said, even store-branded products need to taste good. Judging from the chain’s success, they do. In fact, some Trader Joe’s-branded items may taste identical to brand-name foods. Why? There’s nothing wrong with this, and it’s hardly unusual for brand-name manufacturers to run a side business selling to private labels. But most places that sell a lot of house brands are seen as down-market discounters, not up-market superstars, like Trader Joe’s. So why are they different? Some of the credit must go to the clever packaging and the artful product descriptions. But to get to the real secret of Trader Joe’s, what I think might be the single-biggest reason for its success, you have to go back to Sheena Iyengar. IYENGAR: I have been at the Columbia Business School since 1998 and I started to study choice way back in 1990. Iyengar’s Ph.D. is in social psychology; as an undergrad, she double-majored in psychology and economics. She was born in Toronto to parents who’d immigrated from India. Her background, she believes, gave her a different perspective on decision-making when she started working in the field. IYENGAR: And I got very interested in the kinds of questions that we wouldn’t have ordinarily asked “Well, do all cultures see choice in the same way?” We had assumed that it was innate; we had assumed that everybody saw it the same way, that it was somehow universal. And I think because I was an Asian-American, I didn’t see it as that obvious. She wanted to explore this question with kids from different backgrounds. Her theory was that Asian-American kids and white American kids might think differently about choice. Before comparing the two groups, she wanted to establish a baseline, to confirm that for the white kids, choice indeed had a positive effect. This baseline experiment turned out to be pretty interesting on its own. Here’s how it worked: she brought a bunch of 3-year-olds, one by one, into a room full of toys. Half of them were allowed to choose any toy, and they could switch as they pleased. The other half would be given just one toy with no option to switch. IYENGAR: I started by looking at white American kids because I had to first show that I’m capable of actually replicating what prior scientists would say. So Iyengar went back and examined some of those earlier studies about choice and decision-making. She realized that when those researchers described giving people “lots of choice,” in reality that meant something like two-to-six options. Not a roomful, like she had tried. So Iyengar ran a different study — this time limiting the number of choices, and now she confirmed what her predecessors had found. But she kept thinking about what happened in that first study, with the roomful of toys. IYENGAR: Why were they staring out the window? I don’t get it. I gave them really, really cool toys. I gave them all the most modern toys. At the same time, I was going to this upscale grocery store. The store is called Draeger’s Market; it’s a northern California institution. Iyengar was at Stanford at the time. IYENGAR: So they had like 250 different kinds of mustards and vinegars and mayonnaises, and 500 different kinds of fruits and vegetables, and 100 different kinds of olive oils and, oh my god, it was amazing. And I would go to all these little tasting sessions and try out like 10 different kinds of vinegar. And I also then thought to myself, Well, how come you never buy any of those things you taste? And I then went to the store manager and I asked him whether his model of offering people all this choice was working. Now, he said it did — and he pointed to the traffic, and this store did have a lot of traffic. But it was still an empirical question. Was it helping or was it not? So Iyengar designed an experiment, at Draeger’s, to answer the question. She set up a tasting booth for jams. And she alternated the choice set: sometimes the booth would feature six different jams and sometimes 24. IYENGAR: And we looked at two things. First we looked at in which case did more people stop to sample some jam. And we found that more people stopped when there were 24 on display. So 60 percent stopped when there were 24 on display versus when there were six on display, only 40 percent of the people stopped. And then when people stopped, we gave everybody a coupon giving them $1 off if they bought a jar of jam. And on the back of the coupon was a code that told us if they saw six versus 24. Now what we found was that of the people who stopped when there were 24 on display — only 3 percent of those coupons were redeemed. Whereas of the people who stopped when there were six on display — 30 percent of the coupons were redeemed. Interesting: a larger choice set generates more interest; the smaller choice set generates more action. Sheena Iyengar’s jam study — very simple, but very powerful — would go on to become one of the most famous studies in decision science, because it illustrates what a lot of us feel when we enter, for instance, a gigantic supermarket. IYENGAR: What the finding illustrated was that we want more choice presumably because of all the opportunities it provides us. But when it comes down to making a choice, we don’t want that choice to be too hard or too conflict-ridden or too burdensome. Iyengar followed up her jam study with a look at employee participation in retirement-savings plans. IYENGAR: And essentially what we found was that the plans that offered their employees more options, you saw real decrease in participation rates. So, if you had a plan that offered people less than five options, the likelihood to participate was roughly around 75 percent. And by the time you got to plans that offered people around 60 options, now participation rates had dropped below 60 percent. ROBERTO: It has seven million varieties of toothpaste and tomato sauce. And a Trader Joe’s shelf? IYENGAR: It doesn’t overwhelm me. It usually gives me just a few choices per domain. And having just a few choices per domain is more likely to lead to action. Imagine yourself standing in an aisle in Trader Joe’s when you come across their five-seed almond bars. And your lizard brain says: “Well, there are no four-seed almond bars, or six-seed almond bars — and I don’t even know why I need seeds in my almond bars — but sure, I think I’ll get some of those.” Trader Joe’s understands less-is-more. It understands — to use a word of the moment — curation. IYENGAR: They don’t overwhelm you with choice, which is why you’re more willing to examine each novel choice. There is a story, probably not true, about Michelangelo. Someone supposedly asked him how difficult it had been to sculpt his famous David. And he said, “It’s easy. You just chip away the stone that doesn’t look like David.” I’m not saying Trader Joe’s is quite on Michelangelo’s level, but you get the idea: there is great value in clearing away the clutter. Which is one reason Sheena Iyengar personally loves shopping at Trader Joe’s. IYENGAR: It doesn’t give me the boring stuff, it keeps me excited because I want to see, what do they have? And what do they have that might get me thinking about something I don’t ordinarily think about? So they also maintain the mystery of novelty for me. Novelty is also a powerful tool in sales, and this too Trader Joe’s understands. It is famous for constantly introducing new products — experimenting with them, really. Which means old products have to go. Maybe they’ll come back, maybe they won’t. This strategy would appear to be risky. ROBERTO: Normally, in a typical grocery store, if the item that you typically bought isn’t there, you’re really pissed, right? You’re mad. At Trader Joe’s, customers have come to understand that that’s part of the trade-off. You might see your peach mango salsa disappear, but there’ll be something new to try that you can offer at your next cocktail party and wow people with. Iyengar notes this strategy also gives every trip to Trader Joe’s a sense of a treasure hunt. But that our appetite for novelty is domain-specific. IYENGAR: —because I want to learn about some choices. I’m trying to update my brain on choices. But when I go into my coffee shop in the morning I do not engage in any act of updating. I don’t want to know. I walk into my coffee shop every morning. I don’t even say anything. They just bring me out exactly what they bring me every other day. And it’s made exactly the same and I have no interest in engaging in any kind of variety-seeking. GARDINER: I discovered Trader Joe’s totally by accident. Mark Gardiner again, the former advertising executive who wound up working at Trader Joe’s. He was living in California at the time. GARDINER: I thought it was a local store, it had a kind of a surf theme and I didn’t know any better, because they don’t do any advertising. I only was exposed to it because it happened to be in my neighborhood. Then Gardiner moved to Kansas City. GARDINER: Yes, and that’s when I really learned about Trader Joe’s as a company, because there was no Trader Joe’s. But there were these rumors that we’re going to get a Trader Joe’s. And there was so much excitement. There’s a Facebook page called “Bring Trader Joe’s to Kansas City” that has 5,000 friends. As a former advertising guy, Gardiner was impressed. GARDINER: I think the number-one thing that struck me about Trader Joe’s is that they almost don’t advertise at all. They don’t market. They have a pretty good website now. But for years they had a rudimentary website. They had almost no social media presence. They had almost no kind of public relations. So they didn’t do a whole bunch of the things that I had spent my entire working life thinking, “Well these are things that you do when you build a brand.” So that was really striking to me. And I just had this thought, What if I went and worked there? What would I learn about this company? Gardiner learned enough about the company by working there that he wrote a book about it, called Build a Brand Like Trader Joe’s. How did Trader Joe’s respond? GARDINER: Well, as you know, they’re a very, very secretive company. So they responded exactly the way I expected, which was with utter silence. What initially impressed Gardiner was how Trader Joe’s had grown so much without spending all the money that most firms spend on marketing, advertising, and so on. But what impressed him once he got inside — working as a crew member for $12 an hour — was the company’s culture. Well before the new Kansas City store had opened, on the first or second day of training, a Trader Joe’s executive came in to meet with the roughly 50 new hires, including Gardiner. The proceedings began with that standard, horrifying request to say your name and tell a story about yourself. GARDINER: And I am not kidding you, 50 hands went up. All these people were like, “Pick me. I want to be the first, I want to start. I want to tell you my story.” And I looked around at that group of hands going up, and mine was up too, because I love talking about myself. But most people don’t, at least not to a group of strangers. And I thought, Wow, this is not an ordinary group of people. And what I realized pretty quickly is, Oh my God, this is what they hire for — they hire for this kind of extroverted, naturally chatty kind of person. GARDINER: These guys really weren’t too worried about teaching me how to operate a grocery store, right? I mean there was some discussion about keeping the cold things cold, and how important that is, and there was a little bit of discussion about, “This is how our cash register works,” about, “When you’re bagging groceries, this is how you do it.” There was some discussion of process. But actually there was a lot of discussion of Trader Joe’s values. There was a tremendous amount of discussion about how are you going to be with the customers. GARDINER: No matter how crazy the store was, no matter how much pressure there was to do something else, if you were doing something for a customer, that trumped everything. Seeing how Trader Joe’s encouraged its employees to interact with customers — to partner up with them — didn’t just make sense to Gardiner. It inspired him to wonder why this theoretically-obvious approach is, in fact, quite rare. Consider, he says, a standard trip to the Department of Motor Vehicles. GARDINER: What happens when you go to the D.M.V.? Well, what happens is, you stand on one side of a counter and then there’s your opponent on the other side of the counter. And it’s as if you’re in sort of a game or a sport where you’re trying to get your license plate or a driver’s license and they’re going to say, “Oh yeah, you don’t have an up-to-date inspection certificate for your car. So get out of here.” Right? It’s like a volleyball game, practically. And it’s you against them. Now what if you change the rules and and what if you said, “You guys are both on the same side. Your goal is to get them that driver’s license or that license plate that they need.” And so instead of just saying, “You don’t have the right inspection,” what if you told them, “Look, this is what’s wrong with the certificate that you’ve got. It’s either out of date or it’s from the wrong state, or whatever. And this is where you would go to get the inspection that you need. Right? And let me look at all your other things while I’ve got you here — and if there’s anything else you need, I’ll tell you what you need so that the next time you come, it’s going to be a slam dunk for you.” What if it wasn’t adversarial? What if you guys were both on the same side? “What if you guys were both on the same side?” It’s a good question, don’t you think? Look, I’m not saying Mark Gardiner’s example is necessarily fair to the D.M.V. Nor am I saying that Trader Joe’s should win the Nobel Peace Prize. But, it does strike me that a lot of interactions in the modern world are set up to be more competitive than they need be, and that the benefits of collaboration are often undervalued. I think back to an interview we did with Microsoft C.E.O. Satya Nadella, who has been reversing Microsoft’s longstanding policy of treating tech rivals like Google and Apple as pure rivals. And instead, sometimes partnering with them. NADELLA: [From “It’s Your Problem Now”] Nothing can be taken for granted and there’s no such thing as a perpetual-motion machine. What you have to do is be good at being able to refresh yourself at the crucial times. ROBERTO: To do what they do, you can’t just hire the same people they hire. You have to emulate the private-label strategy. The real-estate strategy. The pricing. The quirky culture. And it’s often the soft things. Not just the kind of people you hire, but the way you train them and the culture you create. I mean, we can build a store that looks like a Trader Joe’s. But when we have people walk in, can they have the same experience? Well, that’s very hard to replicate. Fair enough. And, again, I don’t mean to heap undue praise on a grocery chain just because they’ve found a way to make their appealing food cheap and treat people pretty well along the way. But I will say this: we spend a lot of time on this show, and in modern society at large, pointing out problems and failures and sundry idiocies. It’s nice, once in a while, to come across an institution — even if it’s just a grocery store — that seems to work well, for several constituencies on several dimensions, and to see what can be learned from it. If you have an idea for a future episode about something else that’s working well, and what we can learn from it — let us know, would you? We’re at radio@freakonomics.com. And if you’re dying to learn a bit more about how Trader Joe’s works, check out the episode that the podcast Household Name did about two-buck Chuck, the famous cheap wine beloved by Trader Joe’s fans. You can find it wherever you find your podcasts. Freakonomics Radio is produced by Stitcher and Dubner Productions. This episode was produced by Alvin Melathe. Our staff also includes Alison Craiglow, Greg Rippin, Harry Huggins, and Zack Lapinski. Our theme song is “Mr. Fortune,” by the Hitchhikers; all the other music was composed by Luis Guerra. You can subscribe to Freakonomics Radio on Apple Podcasts, Stitcher, or wherever you get your podcasts. Kirk DesErmia, facilities manager in Seward, Alaska. Mark Gardiner, journalist and author. Sheena Iyengar, professor of business at Columbia Business School. Michael Roberto, professor of management at Bryant University. 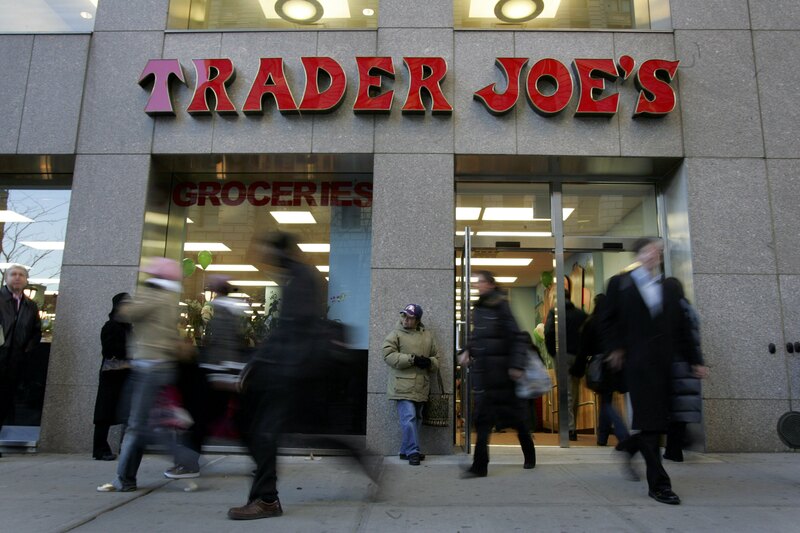 “Trader Joe’s,” David Ager and Michael Roberto, Harvard Business School Case (April 2014). “What Brands Are Actually Behind Trader Joe’s Snacks?,” Vince Dixon, Eater (August 2017). Build a Brand Like Trader Joe’s by Mark Gardiner (bikewriter.com 2012). “When Choice is Demotivating: Can One Desire Too Much of a Good Thing?,” Sheena Iyengar and Mark Lepper, Journal of Personality and Social Psychology (June 2000). Unlocking Creativity, by Michael Roberto (Wiley 2019). “How Can This Possibly Be True?,” Freakonomics Radio (2016). “How to Save $1 Billion Without Even Trying,” Freakonomics Radio (2016).